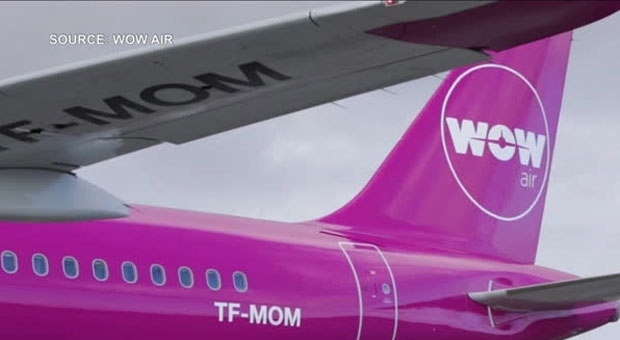 REYKJAVIK, Iceland -- Icelandic budget airline WOW Air collapsed under its financial problems on Thursday, leading it to ground planes and leave passengers stranded across two continents. In Europe, Reykjavik-bound planes from seven cities -- Amsterdam, Dublin, Paris, Brussels, Berlin, Frankfurt and Copenhagen -- did not take off Thursday. One airplane from WOW was grounded as collateral by Iceland's airport operator, which reportedly has a $16 million claim for unpaid landing fees against the airline. "We are trying to figure out how to get home," he told The Associated Press. "We live in Boston, Massachusetts. We've got to work tomorrow morning -- so don't really think that is going to happen." "Not only was the flight cancelled - the airline was cancelled," said Fierce with some humour. WOWs' troubles have put a spotlight on how difficult it is to make budget travel across the Atlantic work financially because the biggest source of profits on these routes are higher-paying business travellers. Rival Norwegian Air Shuttle, which has also struggled to make profits, recently started offering "premium" budget travel to capture some of that market. They say that among competitors, United Airlines stands to gain most on U.S. routes from WOW's demise. Icelandair was quick to offer stranded WOW travellers cheap tickets .